WAIST HIGH: "For 5 Minutes It Was 1982 Again." "For 5 Minutes It Was 1982 Again." Rock trio the Police played their first major public show in more than 20 years on Sunday, when they opened the Grammy Awards ceremony, whetting fans' appetite for an expected world tour. Frontman Sting, guitarist Andy Summers, and drummer Stewart Copeland dusted off a jazzy version of their breakthrough hit "Roxanne" for an audience of about 12,000 at the Staples Center in downtown Los Angeles. 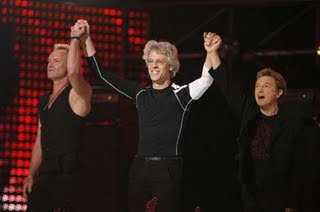 The Police ended their seven-year run following their 1984 world tour for the album "Synchronicity," which included the Grammy-winning song of the year "Every Breath You Take." Sting, now 55, the group's primary songwriter, wanted more creative freedom, and has gone on to enjoy a successful solo career. His estranged colleagues, Summers, 64, and Copeland, 54, have dabbled in various projects but never managed to recapture their glory days. They reunited in 1986 for a handful of U.S. dates on the Amnesty International Conspiracy of Hope tour and also played at Sting's wedding in 1992, and at their Rock and Roll Hall of Fame induction in 2003. The band will hold a news conference in Los Angeles on Monday where it is expected to announce a world tour.